PENDEEN POTTERY and GALLERY - Pendeen Pottery and Gallery: handmade cornish pottery and paintings. Following requests from many customers, Gemma and John Swan extend the warmest of welcomes to you, from Pendeen Pottery and Gallery and our online shop. Visitors to the actual Pendeen Pottery, near Lands End in Cornwall, (and now Poldark country!) 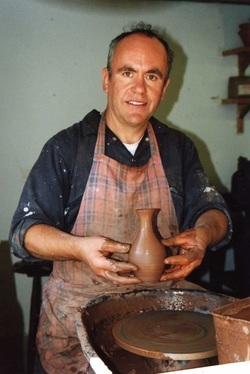 are assured of the same warm welcome from Cornish potter John, and his wife, artist and pottery decorator, Gemma. On display are several ranges of John's earthenware pottery, both attractive and useful, while Gemma's beautiful botanical artwork and still-lifes adorn the Gallery's walls. So we look forward to welcoming you to our working Cornish pottery, where our glazes are inspired by the glorious colours and moods of Cornwall. In the gallery we also have a changing selection of Cornish paintings and crafts, prints and cards. Treat yourself. Take home a Cornish memory today. If making a special journey to see us it is always wise to ring us first to make sure we will be there. Occasionally we are away at a show.